IBM customers using its non-volitile memory express storage gear say they benefit from FlashSystem 9100's predictive analytics, resource management software and smaller form factor. IBM has an answer for some of the biggest trends in enterprise data storage – including Non-Volatile Memory Express (NVMe), artificial intelligence, multi-cloud environments and containers – and it comes in a 2U package. The new FlashSystem 9100 is an all-flash NVMe-accelerated storage platform. It delivers up to 2 petabytes of effective storage in 2U and can provide up to 32 petabytes of all-flash storage in a 42U rack. NVMe is a protocol for accessing high-speed storage media that’s designed to reduce latency and increase system and application performance. It's optimized for all-flash storage systems and is aimed at enterprise workloads that require low latency and top performance, such as real-time data analytics and high-performance relational databases. Storage vendors have been re-tooling their systems to support the faster interconnect protocol, and IBM is no exception.A key change in the FlashSystem 9100 is the use of small form factor NVMe drives. IBM redesigned its FlashCore technology to fit into a standard 2.5-inch SSD form factor with NVMe interfaces – a move that reduced the physical size of the drives by more than half. That redesign made an impression on Owen Morley, director of infrastructure at online dating platform Plenty Of Fish. 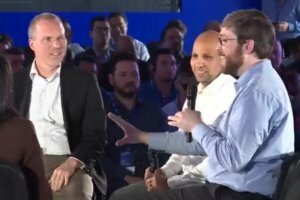 Morley is among a group of users of IBM's all-flash storage who came together at an event in Mexico City to share their thoughts on the new 9100 system and the potential for NVME-accelerated storage in their own enterprises. “The fact that they took the big modules from the old system and collapsed that down to a 2.5 inch form-factor NVMe drive is mind blowing,” Morley said at the IBM event. Morley also noted that IBM’s full range of storage software works with the FlashSystem 9100, including Storage Insights, IBM’s AI-based predictive analytics and storage resource management software, as well as Spectrum Virtualize, which provides storage management capabilities including snapshots, encryption, and storage virtualization. “I cannot wait to just kick those tires,” he said. Plenty of Fish is a longtime user of IBM FlashSystem storage. “We’re driving our flash harder, and getting more performance out of it, and it’s lasting longer than any other storage we’ve ever played with,” Morley said. Looking ahead, Plenty of Fish plans to expand its use of flash storage to more workloads. Morley said the sytem is comparable in price to earlier platforms, plus it offers all the management features with the smaller form factor. “Our backend systems weren’t on the super-fast storage that our production systems are. Now we can pull those forward, and they can get the same performance as production to run the backend of the company, which I can’t wait to test,” Morley said. ZE PowerGroup started migrating its storage infrastructure to flash about four years ago to break up bottlenecks caused by growing data volumes. The data-management software development and consulting firm helps its clients manage risk and refine their market strategies by wrangling vast amounts of data; ZE collects, pools, transforms and analyzes data, so its clients can make data-driven decisions. The FlashSystem 9100 boosts capacity, IOPS and bandwidth compared to earlier FlashSystem models. “It’s quite amazing. I’m really excited about it,” El-Ramly said. Lief Morin, president and CEO of KeyInfo, also stressed the power of speed as a business advantage. KeyInfo, which provides private and public cloud services, uses IBM’s all-Flash storage arrays internally and is an IBM business partner. Streamlining access to data can improve operations. Healthcare clients can improve patient care, and retail companies can optimize operations, for example. “That translates into real business value,” Morin said. “The revolutionary changes we are now seeing with things like NVMe and NVMe [over fabric], the access to all that data, at speeds we’ve never seen before, in form factors we’ve never seen before – these are the revolutions that we’re looking to deliver with the FlashSystem 9100," Morin said. The combining of NVMe speeds with deduplication, compression, data protection and all the software-defined capabilities of IBM Spectrum Storage adds value, and frees resources for clients to tackle other projects, Morin says. IT pros can work on strategic business issues rather than tactical chores such as disk placement. “I’m sure most people in the room remember when we had to lay out the disk arms across the database, across 100 disks to get the optimal IOPS. You don’t have to do that anymore. It’s all gone,” Morin says.